Succeed in your medical terminology course and have fun with Studyware software! This dynamic resource is packed with interactive games, quizzes, and other resources that your mastery of key concepts in the corresponding chapter in your textbook. Janet Romich, a longtime veterinarian, teaches a variety of science-based courses at Madison Area Technical College in Madison, Wis., where she was honored with the Distinguished Teacher Award in 2004 for use of technology in the classroom, advisory and professional activities, publication list, and fundraising efforts. She is also an IACUC member for a hospital research facility and received the Wisconsin Veterinary Technician Association's Veterinarian of the Year Award in 2007 for her contributions to the education of veterinary technician students and in promoting the use of veterinary technicians in the workplace. 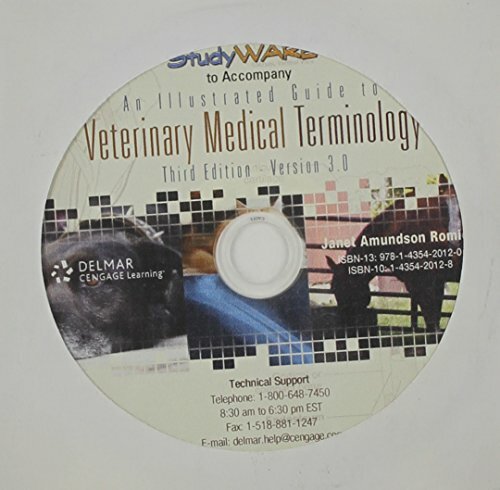 Dr. Romich is also the author of FUNDAMENTALS OF PHARMACOLOGY FOR VETERINARY TECHNICIANS, 2e and UNDERSTANDING ZOONOTIC DISEASES as well as a co-author on DELMAR'S VETERINARY TECHNICIAN DICTIONARY. She received her Bachelor of Science degree in animal science from the University of Wisconsin-River Falls and her Doctor of Veterinary Medicine and Master of Science degrees from the University of Wisconsin-Madison. She remains active in veterinary practice through her relief practice, where she works in both small- and mixed-animal practices.